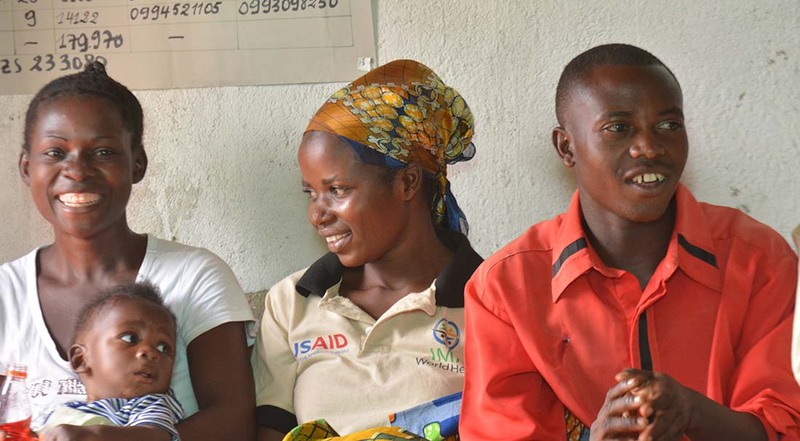 The Ushindi program, which means “to overcome” in Swahili, is a $20 million U.S. Agency for International Development cooperative agreement to implement comprehensive approaches to combat sexual and gender-based violence, or SGBV, in eastern Democratic Republic of Congo. The project worked in 10 health zones and 108 health areas with a target population of 1,592,198. USAID reports show the Ushindi program reached about four times as many survivors as projects with similar funding levels and timeframes. As a result, Ushindi received an 18-month extension in fiscal year 2016 to conduct in-depth research on the project’s implementation model and to develop a readily accessible package for USAID to implement high-quality SGBV interventions in new areas. Through this extension phase, IMA piloted this new package, including cognitive processing therapy-based psychotherapy, in three new health zones to present evidence of efficacy and cost and other practical considerations for scale up. One hallmark of Ushindi is our local implementing partners, who have an extensive history of providing services to victims of SGBV in DRC. The project was managed under the direction of IMA with three local implementing partners: HEAL Africa, Panzi Foundation, and Program for the Promotion of Primary Health Care. To complement implementation by local partners, IMA partnered with four technical partners: American Bar Association Rule of Law Initiative, Save the Children, CARE and Children’s Voice. During the second and third phase of the project, technical partners were modified to reflect the current needs. The current technical partners for the closing extension phase include three technical partners: American Bar Association Rule of Law Initiative, University of Washington with Johns Hopkins University, and OSC. Medical: More than 17,500 survivors have received urgent and free medical care comprising of Post Exposure Preventive kits, sexually transmitted infections treatment, trauma, and fistula care. Psychological: More than 30,000 survivors of SGBV have received counseling including Cognitive Processing Therapy, a form of specialized group therapy. Legal: More than 16,000 people have received legal counseling and more than 3,000 cases of SGBV have been brought to a Congolese court of law. Socio-economic: More than 45,000 people (80 percent women) have improved their socio-economic status through participation in village savings and loan associations and livelihood grants. 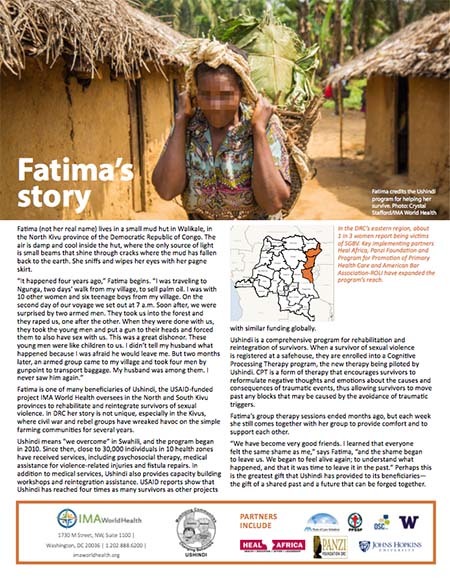 Behavioral change communication: More than 1.7 million people have been reached by BCC activities, including 55,000 community leaders and 388,000 school children. Capacity building: More than 5,500 people have received formal training in the care of survivors and prevention of SGBV, including doctors, nurses, paralegals, counselors and community leaders. Organizational strengthening: 1,500 organizations, including health facilities and youth clubs, have been formed, equipped and strengthened to respond to SGBV in their respective communities. 1) IMA’s strategy to work through the health zone structure and with local NGOs has enhanced sustainability for Ushindi’s activities. 2) The organization of mobile legal clinics has permitted the expansion and impact of legal prosecution. 3) Ushindi’s BCC campaigns reinforced protection of maternal and child rights by dramatically increasing in marriage and birth registrations. 4) The addition of mobile strategies for group Cognitive Processing Therapy has been shown to be feasible.